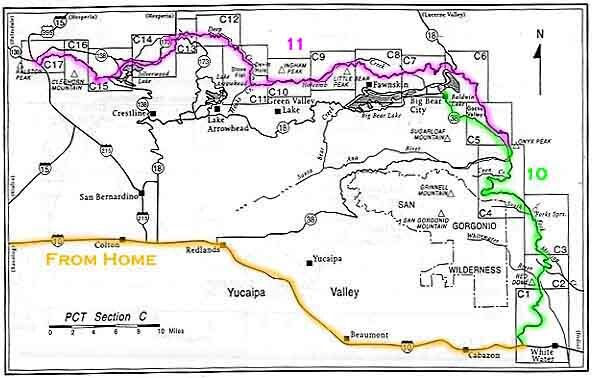 Installment #11 - May 17, 1999 - Off the Map Again! I'm in Summit Valley, calling from the Summit Valley Country Store. Bill McConnell, who is the PCT coordinator for the area, took me from Big Bear out to the trail again. 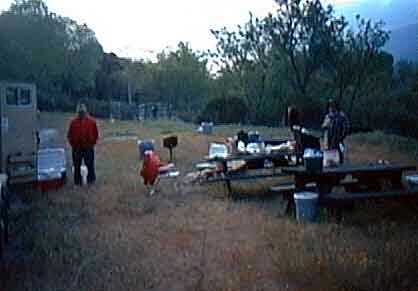 The first night I made it to the Little Bear Spring trail camp. 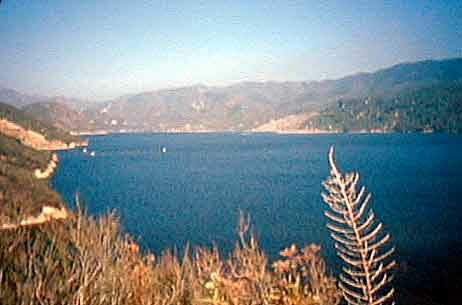 That day, while hiking along the hill there, you can look down on the lake at Big Bear, which was a very pretty hike. The next day was spent hiking down Holcomb Creek and then down Deep Creek through the canyon, again a beautiful trip. About midday, I reached the bridge across Deep Creek, and who was standing there but Meadow Ed! He gave me a banana and some strawberries. I spent a couple of hours visiting with him and then cooked myself lunch. All-in-all, I was there from 12:00 to 4:30 - the hottest part of the day. From there, I continued on down to the end of Deep Creek, which is at a big flood prevention dam and then continued on to where I am now at the Summit Valley Store. The proprietor here is Larry, who's given me some political commentary, and takes everyone's picture and weighs their packs. He has a little book here, so I'm in his book. A lot of the people I know have come through here recently and have their pictures in the book, so I found out where they are. Will came through on the 4th, Nathan and Charlotte on the 7th, Jonathan and Yip came through on the 7th, Jason and Laura on the 8th, Southern Harp and Travelin' Man on the 9th, and Walt and Pat (the Happy Trails couple) on the 13th. Those are all people I know who are ahead of me. I've had a couple of liters of Coke and a couple of sandwiches, and I'll probably have another sandwich or so before I head out. They have internet access here, so I got to check out the web site. I wanted to give you a little story - some tiger statements: Back when we were going by the zoo, there was a caged tiger watching us. Ron Vaughn hollered to the tiger, slowly and loudly, "Turn the latch to the left!" Shortly thereafter, one of the female hikers yelled "Men taste better than women!". And Ron's final comment was "Women run slower than men!". I'm calling from the end of Section C! My last call was from the Summit Valley General Store [hmmm - "Summit Valley" - is it me, or is that a bit of an oxymoron?] on Route 173. 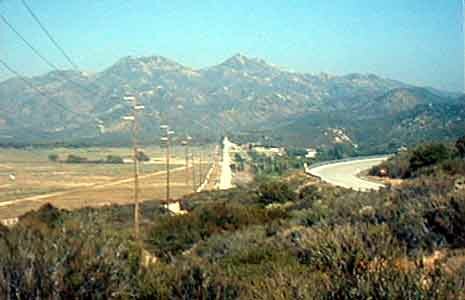 From the store, I walked down the highway and then around Silverwood Lake over to the state camping area just beyond the lake. There's no place to camp anywhere along that way, and my feet got pretty sore. By the time I got to a place where I could stop, I had again developed a blister on the ball of my left foot and a blister on the heel of my right foot. I stayed overnight there with a couple of horsemen who were heading south on the trail. This morning, I went from that point to the end of Section C, so I'm now at the intersection of Route 138 and Interstate 15 at the O'Conomy Motel [love it!]. I've signed up here for two nights - I'm going to give myself a day off and let my feet try to get better. They're certainly nowhere near as bad as they were last time, and hopefully a little bit of rest will keep them in hiking shape. Probably the most exciting thing that's happened since the last report was that I was hiking along the trail, not particularly paying much attention, watching the scenery, not watching where I was stepping. I looked down to see, disappearing under my foot as my foot was going down to the ground, a head of a snake and about the first two inches of the body - that was all I saw - my foot was a half a second from the ground. So I stomped on the snake - there was no way I could stop, and then kind of hopped a couple of steps past as quickly as possible. I looked around and there was nothing in sight, but coming from the bushes just off to the side of the trail was one hell of a rattling! And it just kept going at a steady rate, like a mechanical toy. I think I had hurt that guy pretty bad. He was a couple of feet off the trail, I guess, but I never saw him again - just heard him. Except for my feet, I'm doing fine, and I guess that my feet are going to continue to be a problem. Rob Bedichek was in this motel last night and headed out sometime today. Walt and Pat, the Happy Trails couple, are here in the next room - I met them down the street at McDonald's, where I had lunch before I came here to the O'Conomy. I had a Big Mac and fries and a super-sized drink, and I refilled it twice, so I've had about three quarts of Coke. And that completes Chapter C, as you can see on the Chapter C Map! From where Allen is now, if you check the elevation map, he heads up into the higher elevations again. At least there shouldn't be as many rattlers.